Welcome to the first post where we feature a novel and pair it with a Newsela Text Set. 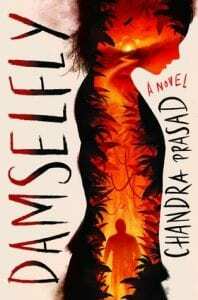 We’re excited to review Damselfly by Chandra Prasad and provide insight into how this book could be used in the classroom and also how it can be paired with a ready-made Newsela Text Set. What an overview, right? I was instantly hooked when I read it and ordered the book shortly after. Damselfly could be applied across curriculum in ELA, history, current events, and Sociology course. It’s a relatively quick read at 259 pages and geared towards students 6th grade and up. I would say the sweet spot for this book is probably grades 8 and 9. Why these grades? I would say the year leading into high school, as well as the first year of high school, are years of self discovery and really finding out who you are. Kids that age will connect with the characters in the book who, when stranded on an island, are fully exposed. With all of society stripped away they must figure out who they are in the world and discover their strengths. Prasad does a fantastic job taking Lord of the Flies, combining it with the TV show Lost, and making something completely new and modern. She really challenges the reader to think about who we are as a person; when all the technology, routines, and structure are ripped away from our lives, what do we become and who are we really? Prasad is able to capture and discuss many issues that teens and society are facing today including depression, prescription drug abuse, domestic assault, eating disorders, diversity, racism, social classes, bullying, mental health issues, struggles with self-image, self-harm, and suicide. One of my favorite parts of the book is the main character, Sam. Sam is an average girl, a sidekick kind of person, who isn’t very popular. Throughout the book, Sam struggles with her identity. She struggles with fitting in, the allure of being friends with the popular girls, and is awkwardly shy when it comes to boys. Her family situation is what really strikes home in the book. Her struggles with a prescription-abusing mom, a verbally and physically abusive father, and a sister who self-harms and has an eating disorder captures the growing issues and concerns that plague families in today’s society. Sam is a character that so many students can relate to and identify with and it’s refreshing to read a YA book that isn’t told from the hero’s perspective. I would definitely recommend this book to anyone who reads Lord of the Flies as either a complete text replacement or as a paired text. The ability of this book to tackle so many modern-day issues sets it apart from many books in the YA genre. There are many different discussions and activities that could be paired with informational text to provide context to this novel. The text set we created helps tackle these tough issues with a multitude of articles to pair with the novel.